The City of Taylor Mill said goodbye to Fire Chief Dennis Halpin Wednesday night at a special reception held at the Pride Park Community Center. 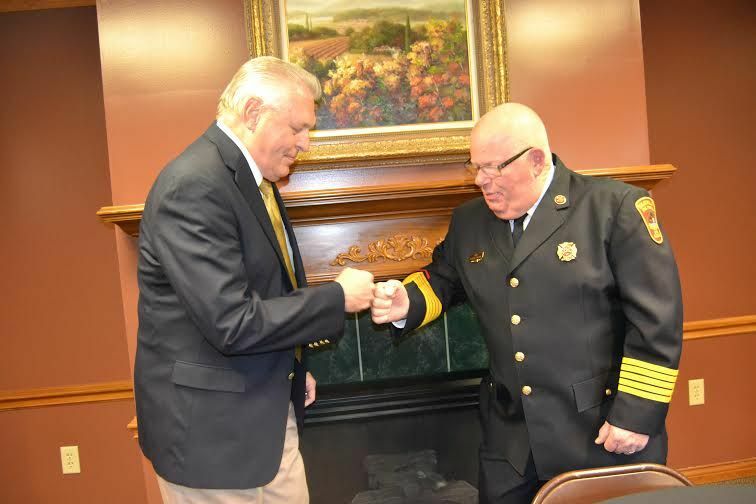 Halpin told the city of his decision to retire early this year, so the city has been fielding applicants to fill the position of fire chief, although everyone acknowledges that Halpin is very hard to replace. “We will always miss Dennis during budget time,” joked Dan Bell, Mayor of Taylor Mill. Dennis Halpin grew up in Park Hills, Kentucky, and attended St. Agnes school and then Dixie Heights. Upon graduation, Halpin joined the National Guard in Ohio, where he stayed on as full time, becoming a tech mechanic. Halpin was a volunteer firefighter at Taylor Mill and rose to the rank of Volunteer Fire Chief in 1987, making him the first in his family to achieve the title of fire chief. At the time, ladies ran the Life Squad, and Fire, Inc. contracted their services to Taylor Mill. In 1996 the city merged all the services together under one city department, and Halpin was over it all. Under his direction, the department became the state of the art fire department that it is today. Halpin has no firm plans for his retirement, but he and his wife Kathy plan to visit Las Vegas for about five days. Many firefighters came to the reception to shake the hand of the man who has been their leader for many years. Volunteer John Simpson and his family came, and he brought a framed picture of himself and the chief.